I read an article on the internet which was credited to professor Akin Oyebode, a professor of international jurisprudence as saying that Nnamdi Kanu is an opportunist and should be called to order. According to the article, this man was threatening that the Nigerian military would crush IPOB and any person calling for secession. I was and in fact remain shocked at the reading of that article being attributed to a man I thought should be a beacon of knowledge and honor, what a shame and unseasoned embarrassment to himself, the legal professionals, the Yoruba nation and the university that made him a professor. I am not talking of the zoo called Nigeria because it has no pride and remains shameless, so that embarrassment means nothing at all. After reading that article I had no other remarks than to conclude that this man is a half-baked professor. I used to imagine the reason why Nigeria should be ruled by illiterates when you have so many intellectuals and educated men and women in it but I am no longer surprised because the likes of this man make no difference on the corridors of politics and would contribute negativity worse than the so called illiterate rulers. The genuine professors would never want to come close to politics probably because they fear corruption. They do not want to be sycophants like this man hanging around the gates of those illiterate rulers from the North. This man casting aspersions on an eminent and highly respected leader of IPOB, Nnamdi Kanu, is a political jobber who does not have time for research development but enough for hypocrisy and sycophancy. I am thinking that he may have been hired by one of those Northern rulers to come up to the media to speak rubbish from his tobacco rotten mouth about Nnamdi Kanu. This busy-body professor said that Nnamdi Kanu is an opportunist but he failed to tell us what opportunity was seized by Nnamdi Kanu and who created such opportunity for him. He said also that Nnamdi Kanu has no mandate to lead the Igbo People, here he failed again because Nnamdi Kanu is not the leader of the Igbos alone but the supreme leader of the indigenous people of Biafra, so for the avoidance of doubts, Nnamdi Kanu is the supreme leader of the Biafran people, he is not just a leader but a supreme leader, he is all about the indigenous people of Biafra and IPOB is a not an Igbo-man affair. 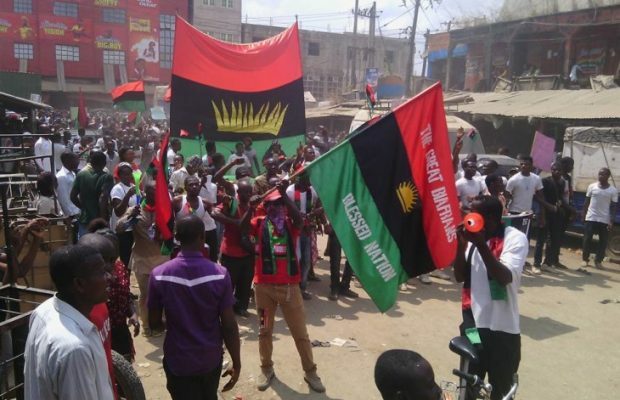 Biafra is made up of all the former eastern states namely; Abia, Akwa Ibom, Anambra,Cross Rivers, Rivers, Bayelsa, Ebonyi, Enugu, Imo, Delta, part of Benue (Idoma), part of Kogi(Igala) and part of Edo (Igbanke) and it is as good as that. The South-south and South-east mantra was all about a ploy to divide an already peaceful people to ensure that they are enslaved forever. There is no law or statute that establishes this divide and rule tactics, neither can it be found in any geographical parlance. It was done by the likes of Akin Oyebode, the same way they removed Bight of Biafra from the map and replaced it with Bight of Bonny, but again they failed because they could not carve out North-north, West-west and East-east to justify their evil game. Another display of foolishness is that this so-called Professor threatened Nnamdi Kanu with the Nigerian military, boasting that freedom is not given but taken and dared Nnamdi Kanu to fight if he can. This in fact is blatant display of stupidity because it is only an insane mind that would think that today would be the same as 1967. Make no mistakes about this fact, the restoration of Biafra has a well-planned progression and fighting war for now is not the option and when we get to that option it is not Oyebode that will tell us that it is time for it, in fact when that time comes Nigeria will know that training special forces in Pakistan would make no sense at all. So at this point I would suggest that the good people of Yoruba nation should call this man back and advise him on how to open his mouth about Biafran issues. And one very important fact he should learn know is that days are gone when a few desperate and foolish Igbo men would go up to the media and issue useless pronouncements on behalf of the Igbo people, just now as I write this piece, power has gone back to the people in Igbo land and in Biafra land in general. Anambra election is coming up in November 2017 which is not too far from now, there is no need to waste words on TVs and radios and Newspapers, let that day come and we will see if it is Nnamdi Kanu or the man that posted the statement Oyebode credited to the Anambra people, it is history that will record the events of that day and not politicians. On the issue of war drums looming according to this Oyebode, there is no reason to wag mouths, let us cross the bridge when we get to the bank of the river. I WILL SUGGEST THAT THIS AKIN OYEBODE BE TAKEN TO PSYCHIATRISTS FOR A COMPLETE MENTAL EVALUATION, HE IS SICK FOR SURE.